The Bowl Gourd is a vigorous annual vine with hairy stems up to 5 m long and soft, hairy heart-shaped leaves up to 400 mm long and 400 mm broad. It bears solitary cream or white flowers that opens in the evenings and are pollinated by night-flying moths. 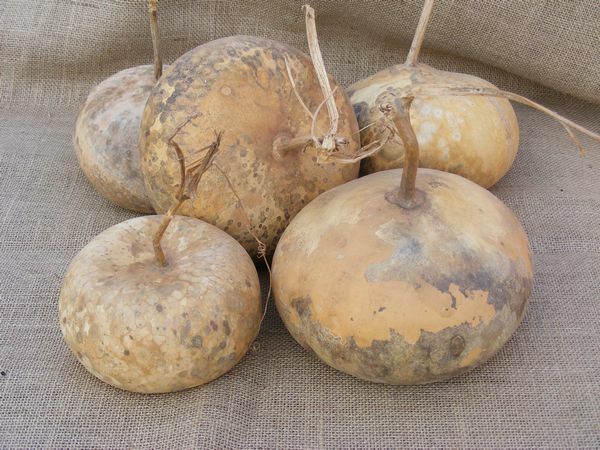 This is followed by large, variable green fruit with a flattened top and bottom, maturing yellowish to pale brown - the pulp drying out completely on ripening, leaving a thick, hard, hollow shell with almost nothing inside except the seeds. The seeds are flat with two facial ridges and embedded in a spongy pulp. It needs full sun and soil pH 6.5-7. Bowl Gourd can be treated either as a prostrate ground cover or as a climber, in which case the maturing fruit will need some support. Lagenarias have a long growing season (up to 120 days) and need early planting to mature before the end of the season. By late summer water should be reduced to permit plants to slow growth and recently set fruits to mature and harden off. In rural areas in Southern Africa, the leaves are commonly eaten as a vegetable and are added fresh to maize porridge. A relish is also prepared from them, mixed with other plants. Dried leaves are stored for use in the lean season. The young shoots and tendrils may also be eaten as greens. Let the gourds completely mature on the mother plant. When harvesting - keep 4-5cm of stem still intact - do not tear the fruit from the plant. Cut apart, scoop out the internal white flesh, and cure at room temperature.